Boil the bananas whole in water for 10-12 minutes until tender. Remove and peel the bananas skin. Cool and slightly mash the bananas. Heat the oil in pan;add cumin seeds,mustard,channa dal and curry leaves and allow them to splutter. Add chopped onion and green chillies and fry till onions are lightly brown. Then add slightly mashed bananas, salt, turmeric and chilli powder. 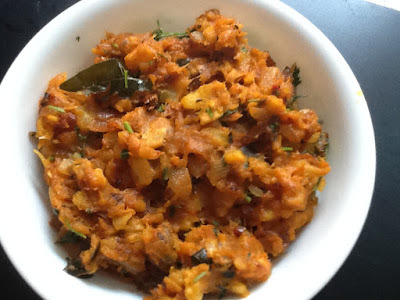 Mix well and add tamarind juice,jaggery and coriander leaves. Mix and cook in low flame for 5 minutes.